Xigmatek introduces the Accessor Ultimate, a new memory card reader plus USB 2.0/USB 3.0 hub that firs in a 5.25" drive bay. Pricing and availability is unknown. No more headache to transfer RAW image file by professional photographer from flash card to PC. Accessor Ultimate offers super-speed flash data transfer by USB3.0 interface. Real support latest extreme-speed flash cards by CF4.1 and SDXC UHS-1. 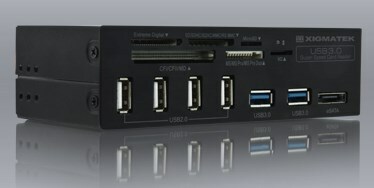 Six ports for CF/SD/MMC/MS/xD/M2/Micro SD cards and extra four USB2.0 and two USB3.0 ports on 5.25" drive bay.